October 4, 2016 nadinelebeanLeave a Comment on Where we’re at. I am discovering that things will be constantly developing in unexpected ways that are completely beyond my control. It’s unwillingness to ripen at the top is what has made it beautifully remarkable and unique. I want to be like this pumpkin. 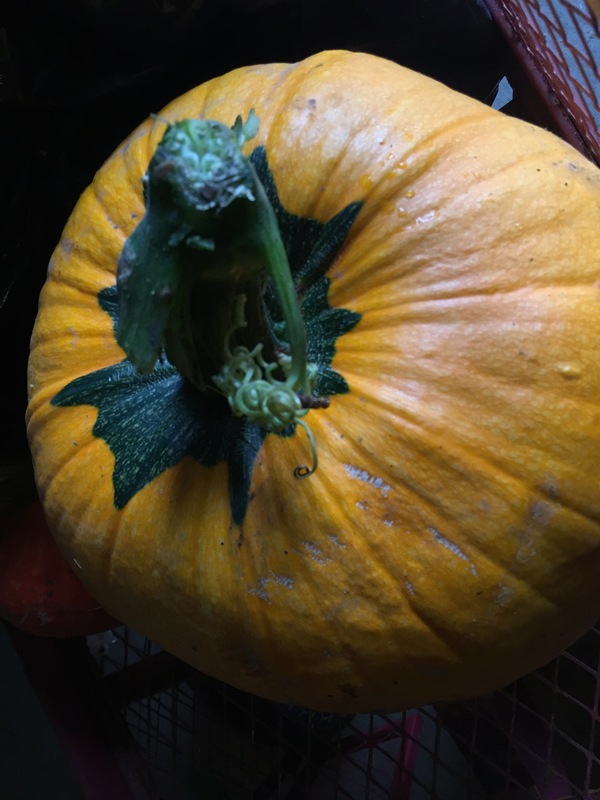 Developing exactly as nature intended and filling my place among pumpkins because of it. What is mine to do? Ripen where you need to and leave the rest for later…or maybe that part is fine as it is, left raw and vulnerable. I never would have imagined that things could have develop to the point where we are consistently sourcing local farm foods and bringing it to people and they buy it and actually want it! I’m so humbled by that. We began with zero experience in business and it seems that this time the passion has been enough to sustain us as we continue to learn and grow and do better all the time. Thinking back to where we began in that old and tiny farm house… it was so run down but it held enough space for us to dream. Originally we had thought we could have our own gardens and animals and supply people with food from our own little sustainable market. Especially if you go at it between two people with no hands-on experience and very limited resources. No amount of passion was enough to deal with the drought and the death that occurred on that farm. So, when it came time…Giving up wasn’t as hard as you would think once I realized that I could still pursue the philosophies we held but in new ways…I wasn’t abandoning my dreams. I began to ask where I was needed and what positions were open to being filled in the quest for people to live better. There has been so many challenges to face and I’ve always been able to justify the stress with knowing that what we do adds meaning to the world. Isn’t that what we all want? To do something that is touching and connects us instantly? A drive out to one of the farms always lifts my spirits as I revisit the inspirations and motivations over rolling prairies of deer and cows and salamaders on the road that I swerve to miss. We are here, brewing with a couple new faces including Michael and Amanda. We are always dreaming and scheming new ways to organize ourselves and bring efficiency. It’s helping. It’s saved me. Once I realized I wasn’t an island, i began to ask for help. The faces showed up in so many forms. People willin to lend a truck when it’s broke down. Many hands to help load and unload. Encouragement. All along I have kind of expected people to tell me I am crazy but not one person has. Turns out that mountains cabbage and literal tons of ethical meat mean a lot to people. They’re willing to wait. They’re willing to help and be a part of building something. We’ve made sooo many mistakes and it’s often left me wondering why people keep coming back and I guess it’s the same reasons that I keep on… we have to. We have to build something better than our system of over priced, industrialized, nutrient depleted (and robbing) foods. But it’s also so much more than that… it’s about reconnecting to what’s been lost. Community and family and helping each other out. Those thins would have been born out of necessity to survive. We have have “enough” food here but is it working for us? I know it’s not working for me when I go to the city and can’t find anything that feeds me to the level I need. It it’s changing. Little corner stores like Eat Healthy Foods in regina and buying groups and gardens! People and their gardens! I’ve seen so many examples of people coming together over too much zuchinni. So, I guess that’s where we are at. Pondering, listening and growing. We need your input and ideas as we move forward. We are loookin for those new faces that want to get their hands dirty. There’s so much work to be done and it’s so good. It’s so good to eat an amazing meal after a morning of hard, meaningful work. It’s so good to make up songs while we do this meaningful work. It’s also good to feel the stress of it all. Someone has to. I’m committed to pushing past the challenges and finding ways for people to be well fed. Next A Space For Everyone.